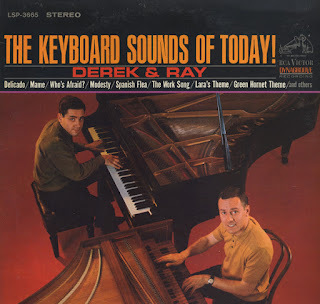 Unearthed In The Atomic Attic: The Keyboard Sounds Of Today! Here we have a groovy 60s "atomic age" keyboard recording with orchestration arranged and conducted by none other than Marty Gold. Gold also gets credit for producing the LP. Amazingly, there is almost no information to be found on this duo. It appears as if they made one other album, Two Different Worlds (RCA LSP 3426, 1965), also with Gold arrangements. Billboard gave that effort a good review. This is so fabulous! Love the Green Hornet theme! They look like they wanted to be the next Ferrante & Teicher! 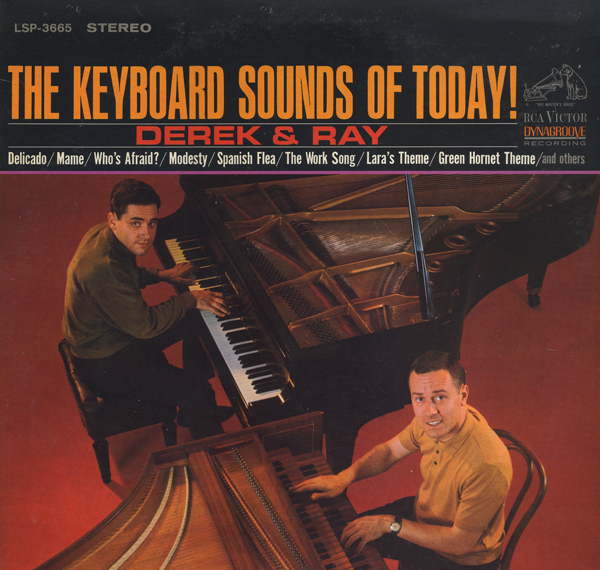 Keyboard sounds of today and the collective age of those instruments is probably 200 years LOL! Either way, you don't get much harpsichord in any day. About the time this was released the Vox company introduced the first successful electronic harpsichord as seen on Lawrence Welk ( reruns on youtube). nice piano and harpsichord combination with orchestral backup awesome! Extra,extravaganza! Super ! Danke!From Russia with love! Gostei muito com a comparação do Ferrante e Teicher foi muito Feliz na comparação.abraço.